Picture Perfect Fit – Come Grow Your Business Here! St. Charles and the new Interstate 90 Business Park, known as the Chattanooga Innovation Park, is the Picture Perfect location for your business. We are located directly between two major population centers in Southeastern Minnesota which provides an ample and quality workforce. Located 20 miles east of Rochester and 20 miles west of Winona, St. Charles offers big city conveniences with the advantages of small town living. Best known for being the Gateway to the Whitewater Valley, St. Charles is a vibrant community of 3,735 people comfortably nestled within the rolling hills and valleys of southeastern Minnesota. St. Charles is a great place to visit and an even better place to live. Our vibrant main street, small town charm, and scenic residential subdivisions make St. Charles a desirable place to live, work and raise a family. While you’re here, play a round of golf at St. Charles’ 18 hole golf course, enjoy a warm summer day at our state-of-the-art aquatics facility, or visit our public library. If shopping is more your style, St. Charles’ downtown area has several antique and specialty shops; a pleasant outing for both the treasure seeker or browser. The community has worked hard to maintain a low tax rate (2012-38%) and competitive utility rates. 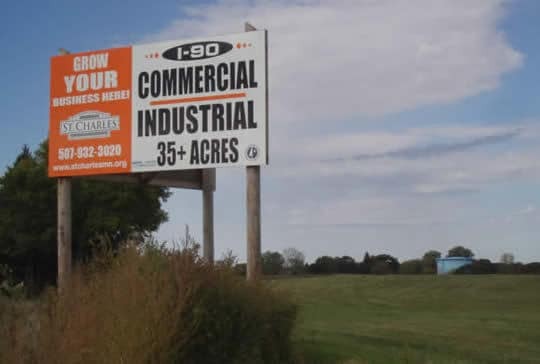 The new Interstate 90 Business Park will provide direct access to major transportation and superior visibility for your company. The park was designed with numerous utility redundancies (water, electric, telecommunications) to ensure that any industry or business can continue its support and service through any obstacle. With development incentives available, the City of St. Charles stands ready and willing to assist you in your project. Please contact either St. Charles Economic Development Director Cris Gastner 651-764-5745 or City Administrator Nick Koverman at 507-932-3020 for additional information on the Business Park and incentives.